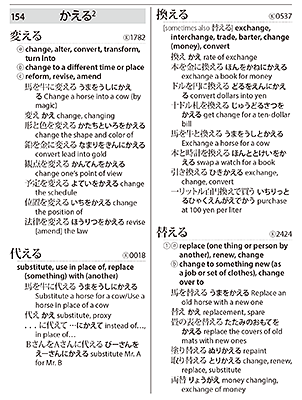 With headwords arranged in Japanese a-i-u-e-o order and thousands of illustrative examples of kanji in context, the Usage Guide is at once a dictionary and a manual—an all-around resource for clarity on kanji used in kun homophones. Armed with this unique guide, learners will discover in kanji new meanings they never knew existed, and learn to write Japanese more articulately than ever before. "A one of a kind work in lexicography....This is a great guide for Kanji learners who were confused about which Kanji to use for different context and situation." Published in 2015, The Kodansha Kanji Usage Guide: An A to Z of Kun Homophones (KKUG) is a new type of reference work that enables learners to deepen their understanding of how kun homophones are used in contemporary Japanese. 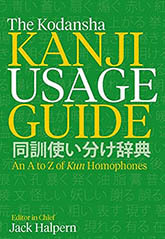 The first Japanese-English resource devoted exclusively to kun homophones, the book presents detailed usage articles that show the differences and similarities for 675 homophone groups, or 1,590 kanji headings—the vast majority of single-character kun homophones in current use. KKUG is based on The Kodansha Kanji Dictionary: Revised and Expanded (KKD) published by Kodansha USA in 2013, originally published by Kenkyusha in 1990. These dictionaries have become standard reference works with a solid reputation in the Japanese-language education community throughout the world. A unique feature of these dictionaries is their detailed treatment of the differences and similarities between closely related characters, including the differences between kun homophones, words like 開く ‘open’ and 空く ‘become vacant’, both of which are read あく. The ability to distinguish between such homophones is essential for mastering the Japanese writing system. Unfortunately for learners of Japanese as a foreign language, dictionaries for native speakers sometimes disagree with each other on how to differentiate between such homophones, and in some cases they confuse the user by lumping their meanings into a single entry with no indication of how to distinguish between them. The KKUG is a new type of reference work that enables learners to deepen their understanding of how kun homophones are used in contemporary Japanese. As the first Japanese-English dictionary devoted exclusively to kun homophones, the KKUG presents detailed usage articles that show the differences and similarities for 675 homophone groups consisting of approximately 1,590 kanji headings and 4,800 compound words and illustrative examples. State-of-the-art typesetting technology was combined with computational lexicography to produce a work that aims to serve as a highly effective learning aid. Based on a systematic approach and in-depth research, this new work helps the serious student overcome the special problems posed by homophones by providing full guidance on the differences between the vast majority of single-character kun homophones in current use. Since homophones are a source of confusion to Japanese and non-Japanese alike, this is of great value to the student striving to gain a better understanding of Japanese texts or to write Japanese with greater precision.